God of War is a series I have enjoyed for several years now. I think all of my reviews have been scores of 8 or higher, and this marks the seventh title in the series (I have played all but Ghosts of Sparta. I really need to get around to picking that and Chains of Olympus up again via the PS3 collection disc, but that is for another time). For those unfamiliar with the series, you follow a man named Kratos who is... well, a very, very angry fellow who kills lots of things in a mythology-inspired universe. 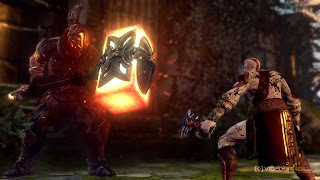 Combat and excellent presentation have been hallmarks of the series throughout its lifespan (which really has not been all that long, as the original God of War debuted on the PlayStation 3). Beautiful game, really. Santa Monica has a reputation for getting the most out of the PlayStation hardware, and it is clearly well deserved. There is an epic sense of scale to many of the scenes, and the characters are both well-detailed and animated wonderfully. If you are offended by copious amounts of blood, you may not want to play however - because you will spill barrels of the stuff. The God of War soundtrack has always been among my favorites. 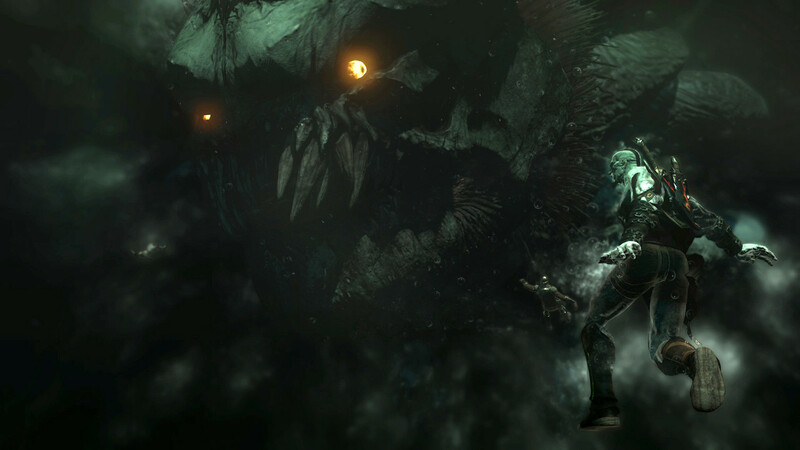 The music has an epic, fantastical sound to it that really accentuates the beautiful graphics. There is some voice acting, and it is usually good stuff, but the voice acting has never really been at the forefront of what the studio is doing. The sound effects are excellent, though sometimes a bit lacking in variety. After all, how many ways can you present rattling chains and blows being landed on bad guys? So an odd hit here, but combat feels a little bit off from prior God of War titles. Not horribly so, and I did like the elemental chains mechanic for the most part, but it still felt just a bit off at times. Also, I am not a huge fan of quick time events - and there are tons of them here. 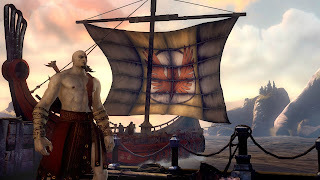 I still think God of War handles them more intelligently than just about any other game, by displaying the buttons to press that correspond to the proper side of the screen to mimic your pad (so for example when you are supposed to press Triangle, it shows at the top, while X shows at the bottom), but there were still a lot of events that relied on very quick timing, and you just never knew when they were needed. I feel like quick time events do pull you out of the game a bit, because you cannot appreciate what is happening on the screen, at least not fully. There is a new 'sliding' mechanic that gets used - a lot. I was really not a fan of this particular mechanic either. I will say that the new cloned Kratos and option to heal/decay your surroundings added a nice twist to the usual puzzle solving. 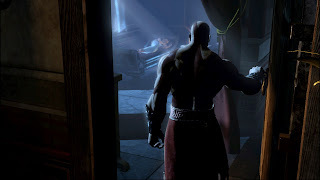 I have been following the story of Kratos for years now, but this was probably the least interesting tale told to date. Here, we see Kratos before he is a complete ball of fury (though there are definitely some anger management issues at work here, he does come across far tamer than in later story lines), and in some ways a little bit more vulnerable. That being said, most of the other titles had these standout moments that really just stuck with me for one reason or another, like Ares marching around a battlefield and the sirens in the desert during the first God of War. The introduction to God of War III was amazing as you were climbing the back of a titan. Even the PSP versions, though smaller and slightly stripped down in mechanics hold up, as I recall the Elysian Fields quite clearly in Chains of Olympus. Here, most of the spectacle is fleeting. Like the other titles, this God of War also feels very short. I beat it in about nine hours or so I believe. I did not die often, but when I did, it felt like it was cheap, cut scene death (with the exception of a trio of fights near the end of the game that are just ridiculously hard - and does not feel any less 'cheap'). Trophies are a bit harder to unlock - the prior games I usually unlocked about eighty percent, and in Ascension it was around sixty. There is a New Game+ and an online mode. There was a lot of talk about the online and... well, the multiplayer really does not impress. It sort of reminds me of Tomb Raider's in that it is clearly an attempt to keep the game in circulation and off of used game shelves longer, but I do not think it is meaningful enough to really pull that off. It may hold out a bit longer than God of War III, which saw sharp price drops very quickly, but not by much. So what we have here is a good, solid action game with some puzzle elements and excellent presentation values. 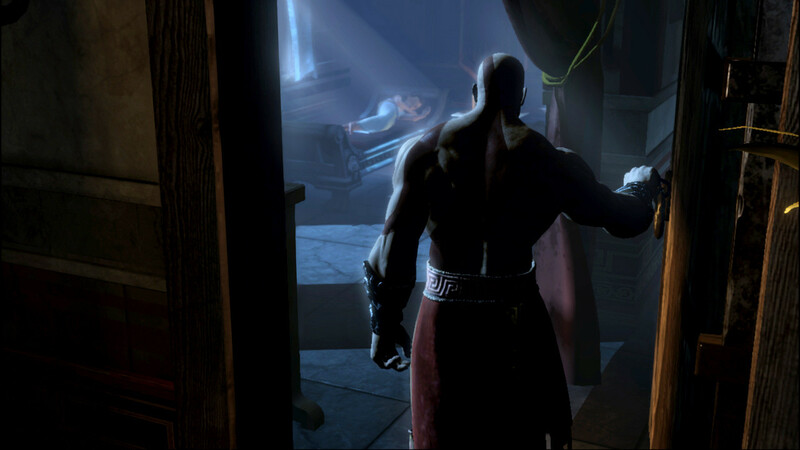 If you are a fan of Kratos and his God of War exploits, odds are you will enjoy yourself well enough here. That being said, this is probably my least favorite game in the studio so far, not because it is presented poorly, but because a few of the staples I come to really appreciate from God of War - story scenes and perfect combat - were just a bit underwhelming this time around.